Keep your essentials within easy reach with our beautiful range of bedside tables. A bedside table will quickly become an indispensable feature of your bedroom. 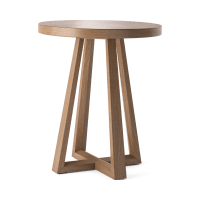 We’ve got a range of bedside tables in different styles, colours, and shapes, so you can find the perfect table to fit your room and your needs. If you’ve gone for a slimline Scandinavian bed frame, stick to the theme with one of our minimalist bedside tables. A round table would suit the look perfectly and works brilliantly in smaller spaces. But if your bed and surrounding pieces (such as your chest of drawers) feature more ornate elements, choose one of our more traditional pieces with beautiful legwork and drawers. Whatever style you choose, whether you’re mixing up styles or matching them to your existing bedroom furniture, just be sure they’ll complement the look you already have going in your room. At Brosa, we take care to sell only the best quality furniture. We pick expert craftsmen who design exquisite pieces that combine traditional and contemporary elements. Our furniture is made from high quality materials from businesses we have inspected ourselves. Every piece is stress-tested to ensure durability. And yet our prices remain incredibly competitive, because we cut out unnecessary expenses to deliver your furniture piece to you direct from the designer. Browse our range of designer bedside tables online today and create a bedroom with all the personal touches that make it truly your own.